In 1996, it was a simpler time in technology. The first games of the Pokémon series hit the shelves in Japan, ultimately selling over 10 million copies, paving the way for the crazy successful multi-billion dollar series. Walking into an electronics store yielded no trace of any Apple product or peripheral whatsoever, making the decision of purchasing a horrible PC equivalent an easy one. 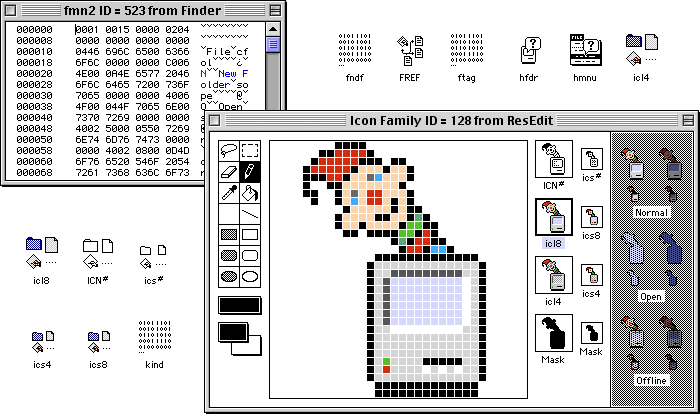 Desktop icons on a Mac (8-bit, 256-color) were hand crafted, pixel-by-pixel in a 32 x 32 grid, via resource editing app ResEdit. Conversely, in many ways, things were far more complex. …Desktop icons for Mac (8-bit, 256-color) were hand crafted, pixel-by-pixel in a 32 x 32 grid, via resource editing app ResEdit. Simplicity came with challenges. Challenges icon designers of the time embraced. Archaic tools were pushed beyond their limits, yielding creativity and detail that seemed to exceed their bounds. Icon designers in the mid 90’s fueled each other to see what could be created with such ridiculously finite constraints. Speed painting videos from our own Mathew Halpern and Ian Harrington show the method behind our madness. Pull up a chair, and prep your pixels: it's time to throw down.